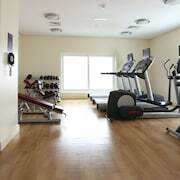 In addition to an outdoor pool, Premier Inn Dubai International Airport provides a 24-hour health club and a kid's pool. The hotel offers a restaurant and a coffee shop/café. A bar/lounge is on site where guests can unwind with a drink. A computer station is located on-site and wireless Internet access is complimentary. Business-related amenities at this 3-star property consist of a 24-hour business centre and a meeting room. This business-friendly hotel also offers a rooftop terrace, tour or ticket assistance and multilingual staff. A roundtrip airport shuttle (available 24 hours) and An area shuttle are complimentary for guests. On-site self-parking is complimentary. Premier Inn Dubai International Airport is a smoke-free property. Located in Garhoud, this hotel is 1.4 mi (2.2 km) from Dubai Tennis Stadium and 1.9 mi (3.1 km) from Dubai Festival City Mall. 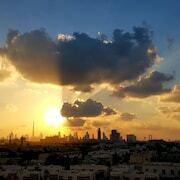 City Centre Deira and Dubai Creek are also within 6 miles (10 km). Emirates Station is 14 minutes by foot. A restaurant, an outdoor pool and a 24-hour health club are available at this smoke-free hotel. Free WiFi in public areas, free self parking and a free airport shuttle are also provided. Additionally, a bar/lounge, a coffee shop/café and a rooftop terrace are on-site. All 281 rooms boast deep soaking bathtubs, and offer free WiFi and sofa beds. 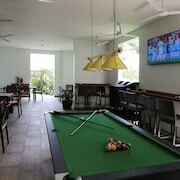 24-hour room service and fridges are standard, as are flat-screen TVs with satellite channels. Premier Inn Dubai International Airport offers 281 forms of air-conditioned accommodation with a safe and complimentary bottles of water. 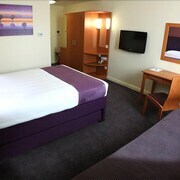 This accommodation is furnished with sofa beds and desks. Beds feature premium bedding. Fridges and coffee/tea makers are provided. Bathrooms include a bath with a deep soaking bath, a bidet, complimentary toiletries and a hairdryer. Guests can surf the web using complimentary wireless Internet access. Flat-screen televisions come with premium satellite channels. Housekeeping is provided on a daily basis. Renovation of all guestrooms was completed in June 2016. Premier Inn Dubai International Airport has a restaurant on site. An outdoor pool and a children's pool are on site. Other recreational amenities include a 24-hour health club.